One of the most common firearms problems that people have is jerking their firearm so that they are shooting groups are below the bulls eye. Sometimes the group is loose, sometimes it’s shaped like an upside down “V”, and sometimes it’s low, but so tight that you might think that the sights are off. This problem is called anticipatory jerk, and it’s normally caused by trying to anticipate the timing and severity of recoil. This problem is one that happens to the majority of new shooters and oftentimes returns, like a stubborn fungus, throughout a shooter’s lifetime. Besides low and/or loose groups, this problem often shows up when pulling the trigger on an empty chamber or a dud round. If you’ve got a problem with anticipatory jerk, the barrel of the gun will dive down as you’re pulling the trigger and there’s no recoil to hide the jerk. This is one of several dozen problems that you’ll find quick, easy, and inexpensive solutions for in my new book: “Tactical Firearms Training Secrets”! 1. I mentioned dry fire training for the “eyes shut” exercise the other day and dry fire training can help you develop the habit of staying on target through the trigger break. Specifically, while dry firing, you want to keep your sights lined up with your intended target throughout your entire trigger press, through the trigger break, and after the trigger breaks as you’re holding the trigger fully depressed. 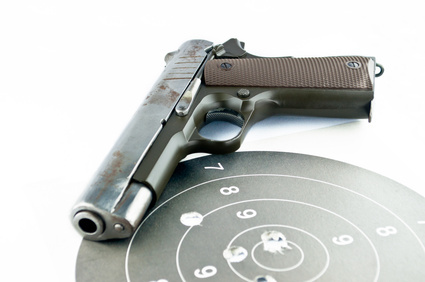 If the muzzle of your firearm “dives” as your trigger breaks, focus on keeping your sights lined up and repeat as necessary until your sights stay lined up throughout the entire process. 2. Put snap caps or dummy rounds in random places in your magazines. Better yet, have a training partner load your magazines for you. As you’re shooting and hit a dummy round, you’ll know immediately whether you’re anticipating recoil by whether or not you stay on target through the trigger break or if the muzzle of the barrel dives. Snap caps are also great to practice malfunction drills so that you can hardwire your brain to respond quickly and efficiently on what to do when your firearm fails to function under stress. 3. Try training with an airsoft “tactical training” class of airsoft firearm. They’re the same size and weight as their real counterpart and will allow you to quickly see whether or not you have any issues with anticipatory jerk. When I’m teaching people firearms skills, I almost always start by having them practice the skills with airsoft before practicing the skills with lead. Besides the fact that some people jerk every firearm they grab, many people will show a high degree of proficiency with airsoft and have their groups fall apart with live fire. In these cases, it is quickly obvious that the shooter can’t say, “I’m just a bad shooter” and that there was a fundamental change in technique that was made during the transition from airsoft to live fire that can quickly be identified and fixed. This quick fix is just the tip of the iceberg of the high speed, low cost, low visibility techniques that I cover in my book, Tactical Firearms Training Secrets. Share a tip or technique you use to improve accuracy in the comments.